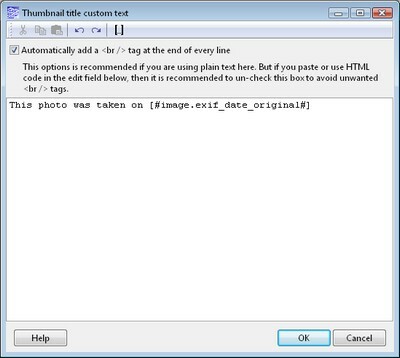 This window can be used to edit the text of almost any text element of the gallery - image descriptions, page headers, image or thumbnail title custom texts, etc. In the image below this window was opened to edit the thumbnails title custom text. You can add special tags here to add gallery or image specific information to the text. Simply click the button or press Ctrl + I on your keyboard. Also at the end of every line the [#new_line#] special tag is added automatically. This options is useful if you type or paste plain text in this edit field. It allows you to keep your line breaks in the resulting HTML pages by adding the <br /> tag (line break) at the end of every line. But if you type or paste HTML code in this field, then it is recommended to un-check this box to avoid unwanted <br /> tags.